LUKE CAN DESIGN A PARTY TO SUIT YOUR INDIVIDUAL NEEDS! 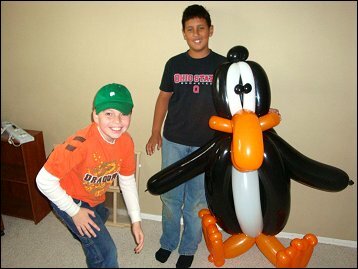 Luke offers two kinds of parties, and then you can personalize the features to make the party or event exactly what you want it to be! FUN JUGGLING: Juggling balls, rings, clubs, ball spinning, plate spinning, and other assorted juggling tricks. Weather permitting, Luke will juggle FIRE TORCHES an impressive hit! 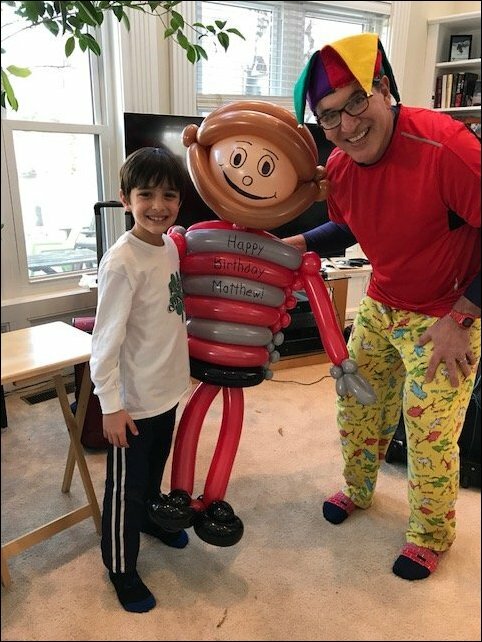 The Birthday Kid is featured twice as he/she assists Luke with a fun ball-spinning trick and double plate-spinning routine! MAGIC: This show includes slapstick gags that are sure to bring smiles and laughter to the face of your child! 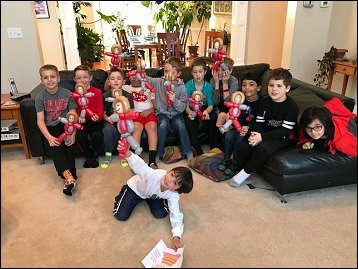 Tricks include a rope that freezes solid, a ketchup bottle that squirts out red yarn, a hilarious peanut butter and jelly routine, a funny puppet named Charley, and more. The Birthday Kid helps to close out the show as Luke's "Magician's Assistant" with a classic "torn and restored" Magic Change Bag trick that is sure to mesmerize your audience and provide lasting memories for the Birthday Kid. 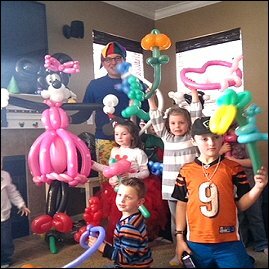 PRE-MADE BALLOON SCULPTURES: Each party guest takes home a party treat from Luke the Juggler! 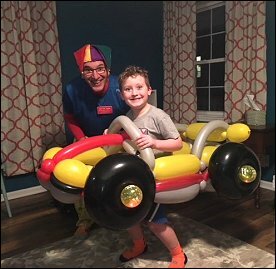 Before the party, Luke gets your kid count and information about the crowd makeup, and he creates popular, fun 2-balloon sculptures for all the kids, including the Birthday Kid. The balloons are transported in large plastic bags and saved for the end of the show. 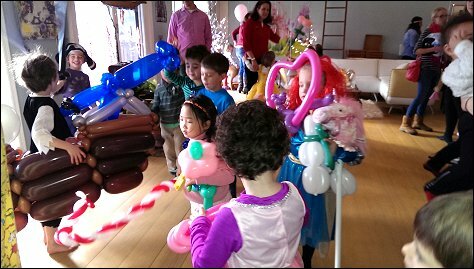 After the show, Luke distributes one balloon sculpture to each child. 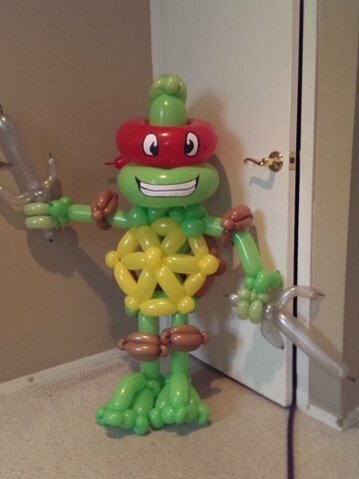 Luke always makes extra balloon to leave at the party in case one of the kids accidentally pops his/her balloon. This helps avoid that dreaded "meltdown" when one child suddenly doesn't have a balloon! As detailed in the Full Show, Luke gets your kid count ahead of time and creates fun balloon sculptures for each child at the party. 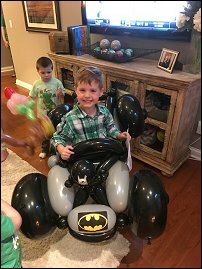 Balloons are very fun if you are the first or second child to get one, but not so much fun if you have to wait a while before your first balloon. 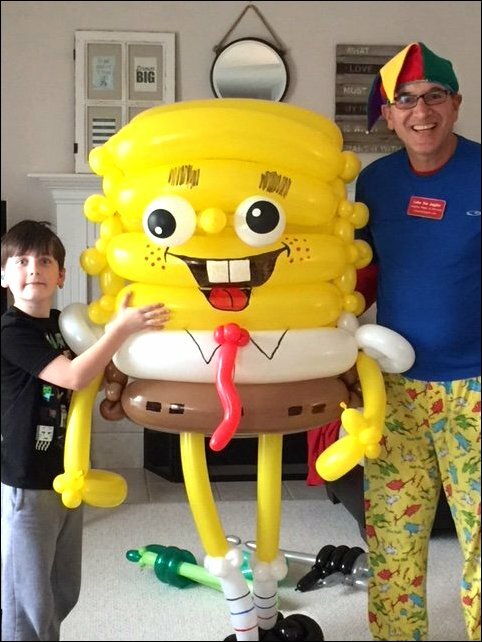 With the Pre-Made balloons, every child has his/her first balloon within five minutes of the start of the party! This makes waiting in line a little easier, and satisfies even your youngest party guest, who simply wants any kind of balloon to carry around. 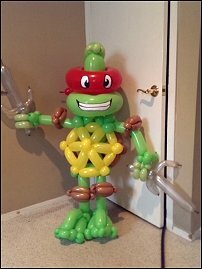 For one hour, Luke twists fun balloon sculptures for all the kids. Luke can make more than 75 different types of sculptures that are designed for quick assembly, and which have a BIG impact! 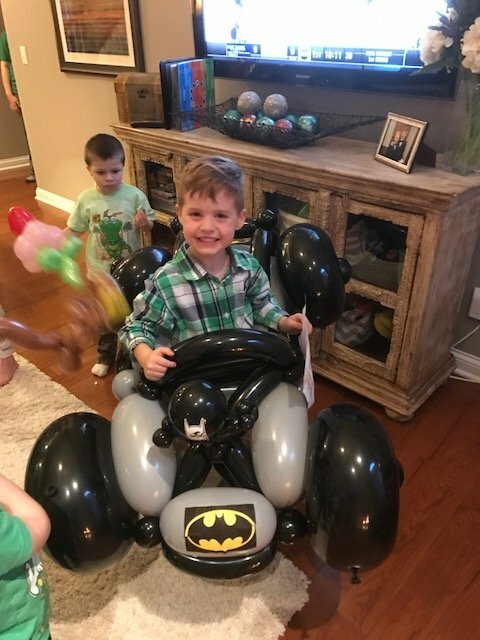 Choices include almost any animal that kids like, as well as superheroes, Disney favorites, zombies, aliens, ninjas, emoji faces, a variety of hearts and flowers, weapons, Halloween favorites, Christmas themed sculptures, and more. For an additional fee, Luke will create a Large Balloon Sculpture, specially designed for the Birthday Kid. This sculpture is BIG, measuring 3-4 feet tall, depending on the type of sculpture you select. 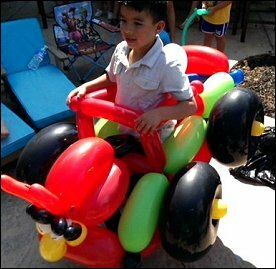 While it can be part of your party theme, this is usually something that is a favorite of your Birthday Kid. Super Heroes and characters such as Spiderman, Batman, Iron Man, The Hulk, Aliens, Zombies, Ninjas, Ninja Turtles, and Brutus Buckeye. Disney favorites such as Elsa, Anna, Olaf, Mickey Mouse, Minnie Mouse, and a variety of princess designs. Luke can create your child's favorite animal, fish, or bird, and he can make all kinds of flower arrangements. Comic characters such as SpongeBob SquarePants, Mr. Crabs, Mario and Luigi, Minions, Sonic, Thomas the Tank Engine, Elmo, and more. 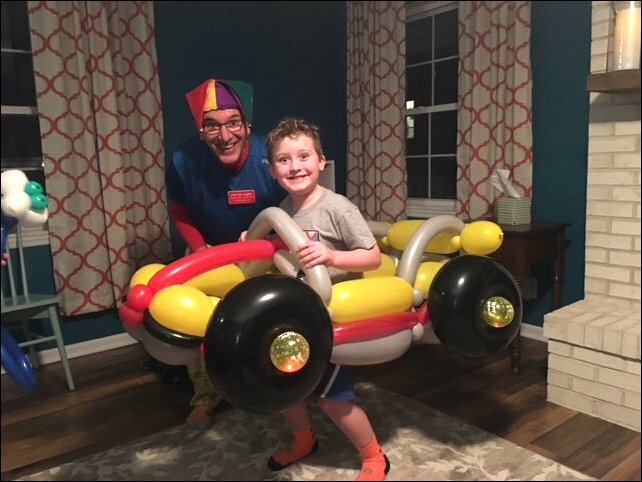 Luke makes "wearable" balloon designs that have a space in the center so that your child can climb into the center of the balloon and "drive" or "ride" around the room! 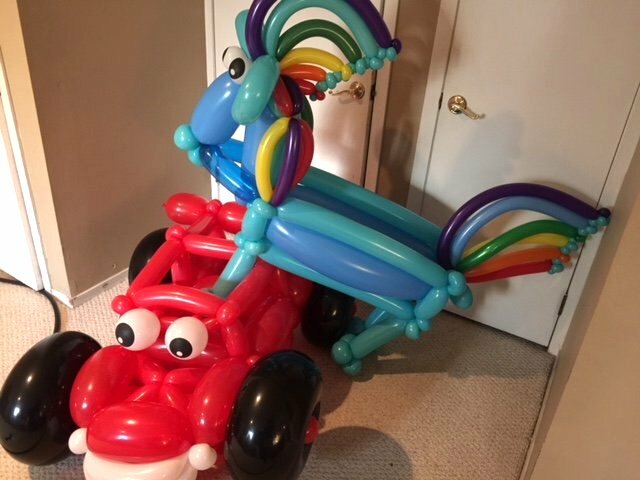 Current designs include "Rainbow Dash," a Pirate Ship, and a variety of cars, rockets, and airplanes. Visit Luke's Facebook page for more examples of his large sculptures! © 2001-2018 Luke the Juggler® - Luke Kareklas. All rights reserved.